100 Breaths is a system of meditation designed to be practiced by anyone with a desire to learn meditation and enjoy the benefits, without being tied to a particular philosophical or religious doctrine. 100 Breaths is meditation without rituals, dogma or other spiritual overtones. I first became introduced to meditation in 1975 while still in high school. I felt the benefits immediately and became forever intrigued by the power of this simple and yet effective activity. I meditated twice daily and found that I could easily relax myself and noticed the sensation of having a clear head . I found I could create relaxation-on-demand as a way to instantly de-stress or recharge my batteries. I also found meditation to be an excellent precursor to activities that required focused concentration and a certain frame of mind such as sports or taking a test. Over the last 42 years, I have studied many different styles of meditation and practiced the various techniques. I found that each style had its own peculiar process or ritual based on the origins of that particular technique. Some were rooted in eastern spiritual practices (Hinduism, Taoism and Buddhism); some were evolved from energy work associated with the principles of oriental medicine used in Tai Chi or Qi Gong to manipulate the Chi energy. Still other systems were developed as part of western psychology as relaxation techniques (Relaxation Response). After studying and practicing a variety of systems, I have settled in with a blend of techniques that together, form the 100 Breaths system or method of meditation. With 100 Breaths, I have tried to synthesize what I have learned through my exposure to many different meditation techniques into a simple, yet effective how to manual. 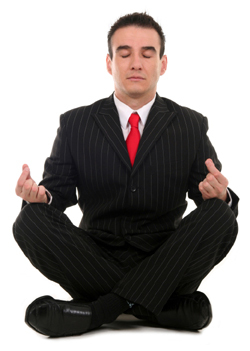 As a mainstream business executive, working as the CEO of a mid-size company and living in the suburbs, I get interesting looks when I mention meditation in casual conversation. Actually, I usually get one of two reactions. The first is that the other person keeps right on talking and acts as though they never heard me mention it. The second reaction would be genuine curiosity and interest about meditation and wanting to learn more. I find that the people that are interested in meditation usually have very little idea of what it is and why you would do it. If they do have any knowledge at all, it is often riddled with misconceptions. I devised the 100 Breaths Meditation System to share what I have learned and introduce people to a simple procedure that when practiced, brings immediate and profound benefits to them. It is really all you ever need to reap the benefits that meditation has to offer. The purpose of this Web Site, simply stated, is to share something that has benefited me greatly and make it available to others. I believe that meditation is an activity that yields physical, mental and emotional benefits pure and simple. If I can change just one person's life by sharing the 100 Breaths system and motivating them into action, then the effort will have been worth while.